I have to sit down and share a couple of the things that I am extremely thankful for on this day in particular. Mind you there are so many things that I am thankful for, like the wonderful friends and family in my life. I’ll give each one a separate blog since I will probably ramble a little about each and don’t want you to feel like you’re reading a novel. A year really does pass fast when you sit and think back on a major event in your life. 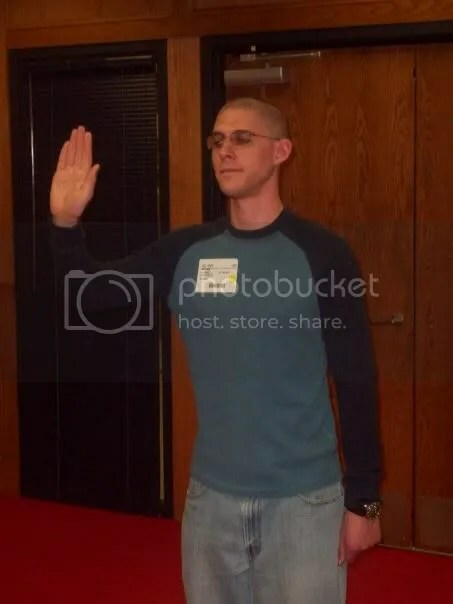 It has been one year today since Taco swore back in to the ranks of the military, this time for the Army. I can still remember that day like it was yesterday. I cannot begin to describe the pride that I felt for my man at the moment this photo was taken. Not just because such a great and wonderful person would once again be serving our country, but because of all of the hard work he put into getting to that moment. I hope that when I share with other people the struggles he went through with his Air Force career being shattered doesn’t sound like I am being bitter. I am not. I love the Air Force just as much as I ever have, and while everyone has their faults, I do think that there are several lessons that “they” could learn from his experience. In reality, Big Boss of the Air Force will probably never hear about it, and there isn’t anything that can be done anyway. So instead, I look more on the fact that Taco has those experiences behind him that are certainly already shaping him into the kind of dedicated soldier that he has become. He has certainly had his share of struggles even after having answered that call. But he knows that nobody ever told him it would be easy. I’m so proud of him, that he truly gives meaning behind the phrase “soldier on” – holding his head high through every task put before him. He will be blessed beyond measures and I can’t wait to see how the Lord will work in him next! I also can’t wait for this year of deployment to pass as fast as the last year has! « my Military Spouse Appreciation Day giveaway!